Enjoy the pleasure with this Alfawise XBR – 08 TV Soundbar Bluetooth 4.2 Speaker which features perfect stereo audio and multi-functional operations. 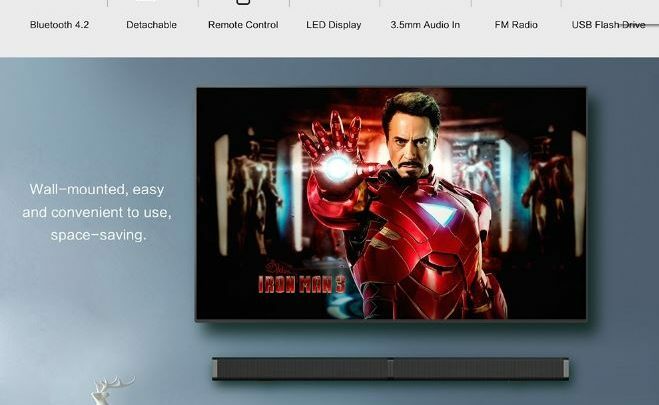 The Soundbar has a minimalist design with long horizontal lines, a black body, and an engineering plastic shell. 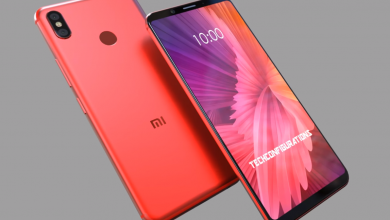 Its dimensions are 47.3 x 6 x 6.00 cm and its weight is 1.58 grams. 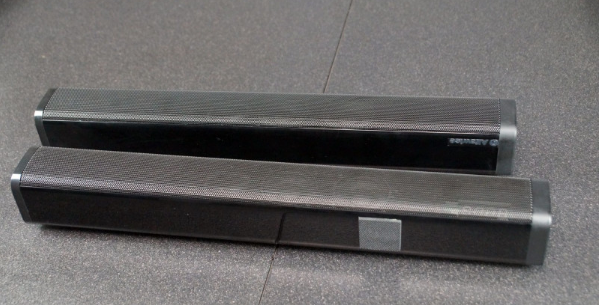 The soundbar comes with an anti-slip piece of rubber with jagged edges. While using the column as a soundbar, this is not much noticeable, however when you separate columns, it immediately catches the eye. Behind the Alfawise XBR-08 soundbar, there is a plastic mount on the wall and “tongue” of the cable, so as not to droop and dangle. It Adopts high-quality engineering plastic shell, makes a fashion and stylish appearance, this speaker will bring you the best listening enjoyment. It is smaller than the usual home speaker, with a compact and portable design, you can also take it to the outdoor for using. Get the party started without the wires and cables and enjoy your latest party playlist. It is embedded with a 4 x 10W sounding unit + 2 x passive radiator, perfect for displaying the tri-band effect of sound. It also comes with a remote control for comfortable and convenient operation. 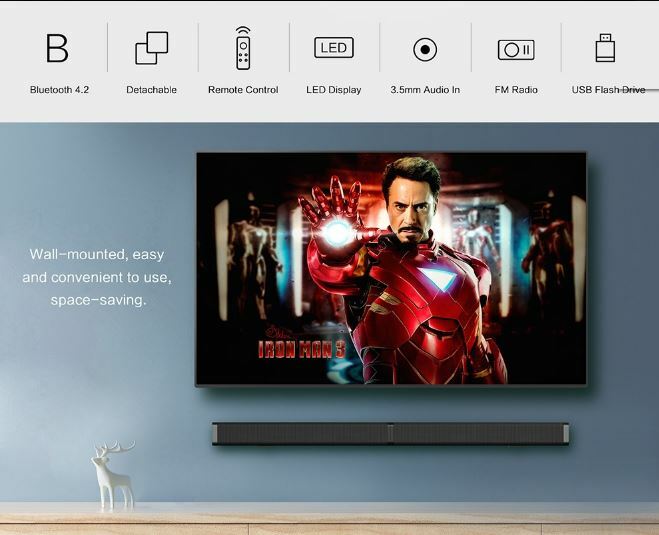 The soundbar Supports Bluetooth 4.2, USB, TF card, optical, line IN, AUX, multiple device interfaces for easy connection. One thing we definitely like with the Alfawise XBR-08 soundbar is its built-in six equalizer modes. Moreover, they are not just for show, and the sound in different modes is entirely different. 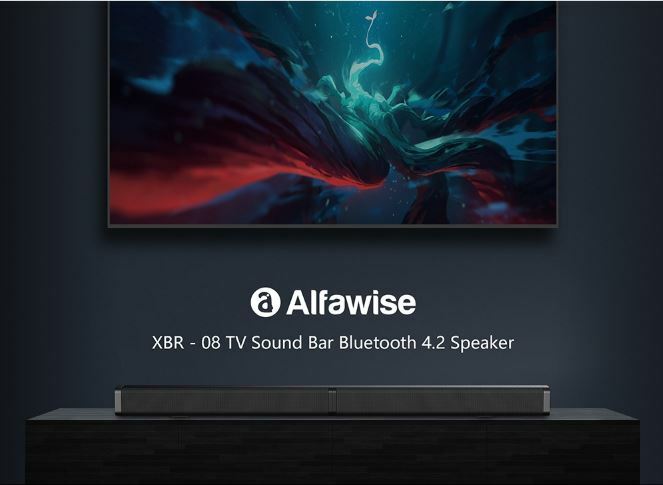 The Alfawise XBR – 08 TV Soundbar Bluetooth 4.2 Speaker is currently available on Gearbest for $55.99 using Coupon code: GBH0413S4 and it is limited to 50 unit.